Are you looking for maintenance for high performance cars in Haywards Heath? For prestige car servicing and repairs, get in touch with the dedicated team of professionals at Owen Garages Limited. We are specialists in Japanese Performance cars, offering full diagnostic, service and repair facilities. We also repair and maintain all makes of cars, including all the latest makes and models. If in doubt give us a call. When you want prestige car repairs in Haywards Heath, Owen Garages Limited has the ideal combination of expertise and experience to deliver a first class service at the most competitive of industry prices. We are fully trained technicians, priding ourselves on our ability to maintain high standards of work while remaining cost effective, and strive for complete customer satisfaction with every job we undertake. All work is fully guaranteed for your peace of mind. For help with repair, servicing or maintenance for high performance cars in Haywards Heath and the surrounding areas, Owen Garages Limited can exceed all your expectations. We welcome enquiries from the trade and domestic sectors, looking for standards of service without the main dealership costs associated. Don't be tempted to settle for second best with prestige car repairs in Haywards Heath - look to Owen Garages Limited. 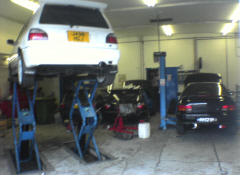 All cars, import and modified welcome, BOSCH DIAGNOSTIC SYSTEMS SPECIALIST. KTS 650. We will also do MOT's by prior arrangement.